When looking for a unique and challenging internship opportunity for this summer, I turned to the health care industry for an engaging atmosphere that would develop my professional skills. The health care industry presents complex and interesting problems in an ever-changing socio-political environment. With this varying legislation and regulation comes the adaptation of health care providers and payers to ensure quality patient experiences. Working at UPMC this summer has shown me the intricate details of finance and accounting within the health care realm. From pricing out product costs to analyzing volumes of patient cases, the environment in which UPMC thrives is certainly challenging. Indirectly, the work that financial analysts and accountants do every day plays a vital role in patient experience and overall operation of the hospital system. Specifically, a skill that I have worked to develop during my time in the health care industry is flexibility in adapting for situational change. Truly, there is so much learn through a finance internship and the wealth of exciting opportunities at UPMC that would probably be inaccessible in other programs. One particularly unique facet of working in health care finance is the opportunity to actively function within patient care, as we strive to improve the patient experience. Simply put, it is difficult to budget for the imaging department if you don’t understand what the department does. 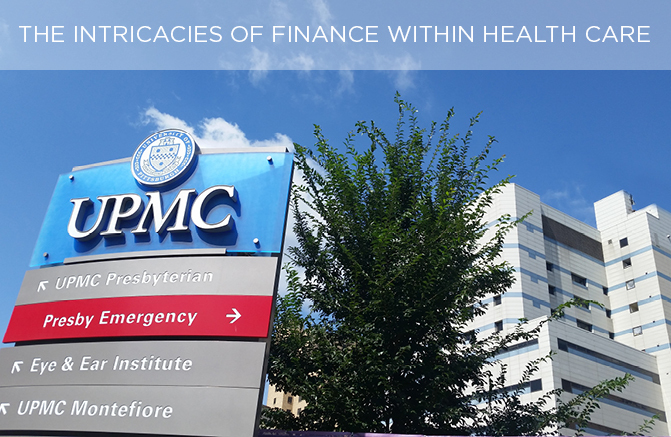 As a UPMC Finance Summer Associate, I was able to witness not one, but TWO surgeries. Let me tell you – being in the operating room really brought all finance and accounting processes into perspective! I’ve learned that working in health care finance means working toward a bigger purpose. The field is rewarding for it allows employees to impact the community as a whole, and I feel fortunate to have gained these valuable insights as a UPMC Finance Summer Associate.